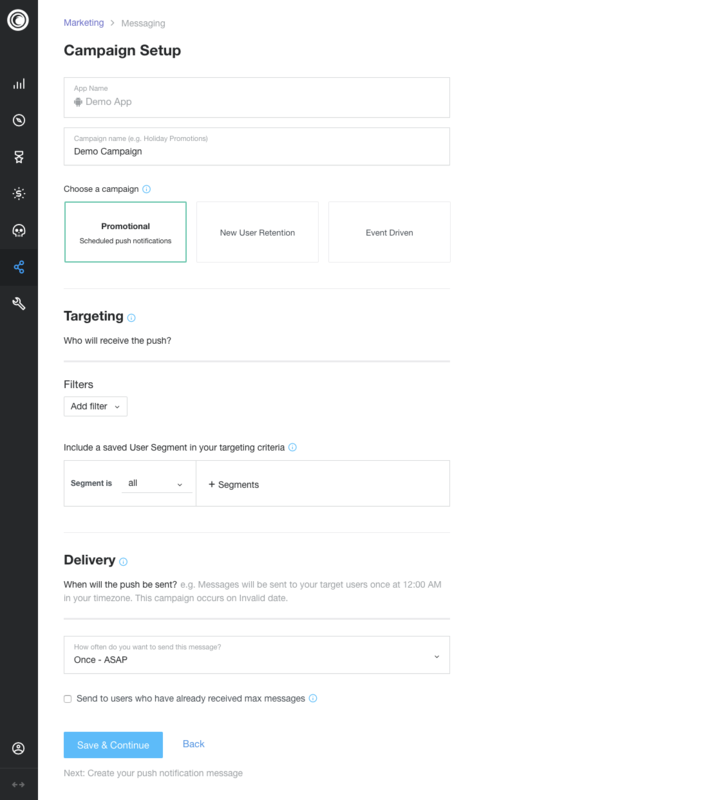 To create a campaign in Flurry Push, first navigate to the Flurry Marketing tab. Use the dropdown to select the app you want to create a campaign for. Setting up is a three step process. To begin, click the Create Push Notification Campaign button. On the first step, you give your campaign a name, choose a campaign type define your targeting, and set delivery options. On the next step, you set up the push notification message itself. On the third and final step you review your campaign details, test the push and activate it. For new campaigns, your options are saved as draft as soon as you click “Save & Continue” on the first or second step. Note: For active campaigns, most campaign fields may be edited while the campaign is running. This means that changes to campaign targeting conditions, delivery options and the push notification message itself will immediately impact an active campaign.